Author: Pius W. Akumbu. Series edited by: Roger M. Blench. 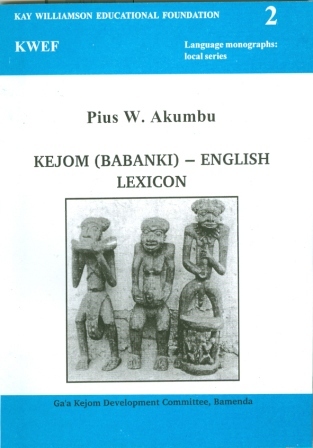 Kejom Babanki is a Grassfields Bantu language of Cameroon that belongs to the Central Ring languages in the region Northwest of Cameroon, spoken by about 22,500 people (estimation of 2000). This provisional lexicon has been compiled primarily for the speakers of Kejom, though it will also be of interest to non-speakers who desire to study or learn the language. The lexicon will likely stimulate interest in the use of the language in its written form and will be a useful tool for those learning to read and write the Kejom lan­guage. This lexicon is a step forward in the preservation of the cultural identity of the Kejom people, which is facing extinction as we evolve. Finally, this lexicon may be used as a reference material in standardizing the spelling of Kejom words and terminology. Over 2,000 entries that serve as an introduction to Kejom words and phrases are found in this lexicon. The 1,800 SIL Comparative African Word List served as a thematic basis for the initial collection of words. Each lexical entry includes a phonetic transcription, part of speech, noun class and a brief definition in English. Additional information such as: variant forms (form spoken in Kejom Kettingo), and plural forms of nouns may also be found. A general introduction precedes the body of the lexicon. The phonology of Kejom is briefly presented and the Kejom Alphabet is provided. The noun class system of Kejom is also introduced. Some modifiers like possessive pronouns, demonstratives and some numerals are shown in this part. Following the body of the lexicon is an English-Kejom Index of more than 2,000 entries.